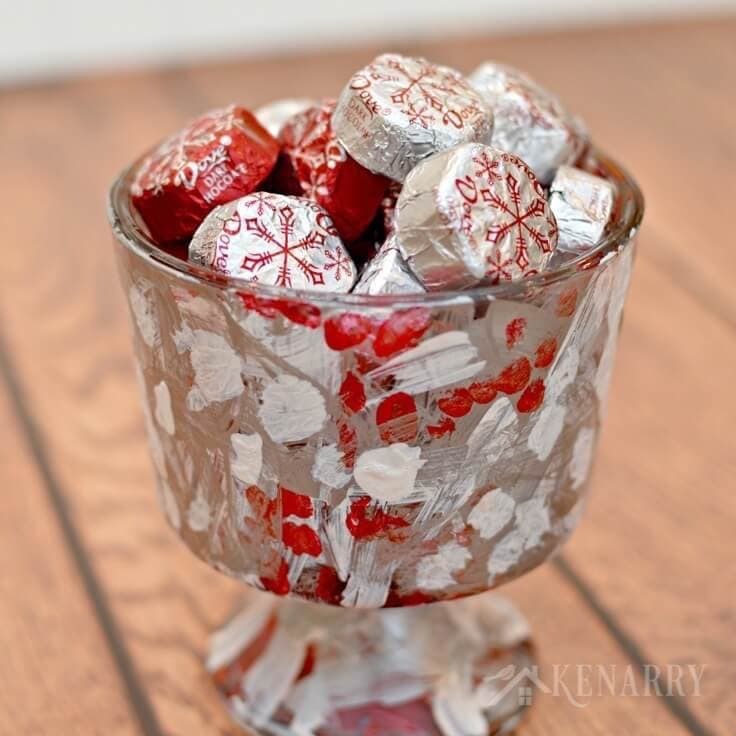 A hand painted holiday candy dish is an easy craft idea kids can make as Christmas gifts for teachers, grandparents and other special people in their lives. Merry Christmas! 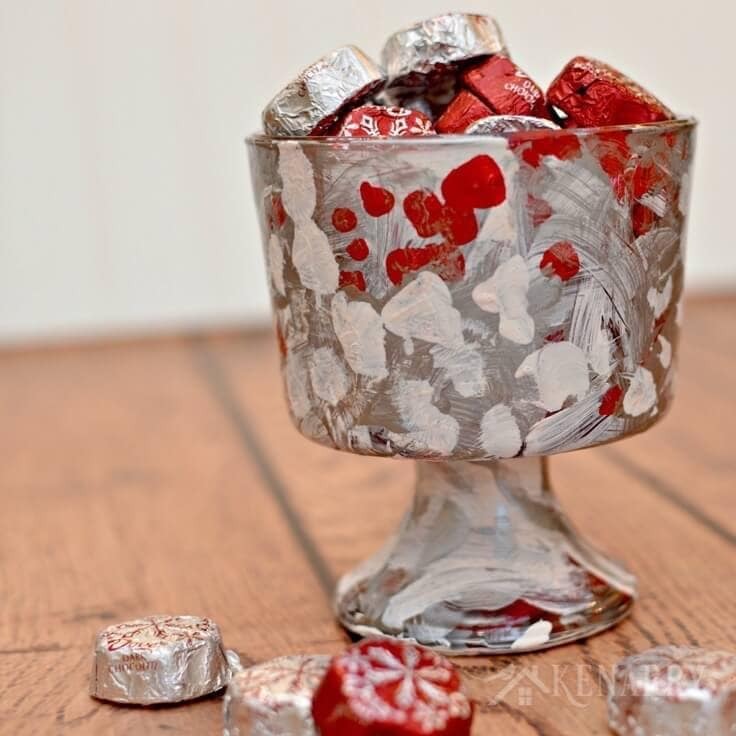 ‘Tis the season for gift giving and today I’m going to show you a really easy craft idea your kids can make – a hand painted holiday candy dish. When it comes to teacher gifts and presents for grandparents, I like to involve the boys in the creation of the gifts whenever possible. It’s one small way to help them understand the holiday season is a season of giving and gratitude. For teacher gifts a few years ago, we put together cake-in-a-mug gifts paired with a gift card to a coffee shop. The following year, he created hand painted canvas art and combined that with a gift card to Hobby Lobby. Last year my son’s class took up a collection and did one big group gift, so we skipped the gift card. Instead we just made a special holiday candy dish for his kindergarten teacher and filled it with dark chocolate since that’s her favorite. The idea for a hand painted holiday candy dish came to me after I painted a platter for Thanksgiving last year. It was an easy thank you gift for my brother who hosted us for the big feast. I knew my son wouldn’t have the patience or dexterity to paint words on glass like I did, but I thought I could let him just freestyle it. My hope was that the holiday candy dish would look marbled and abstract. 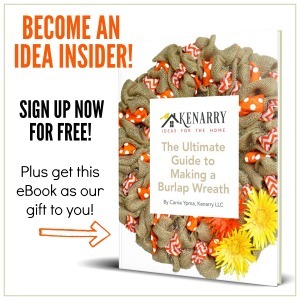 I wanted it to be more like something you’d buy in a boutique or gallery than a kid craft. More than that I wanted my son to feel like an artist and to feel proud of his gift for his teacher. He chose the colors and techniques he used though I did encourage him to make sure he covered the entire holiday candy dish with paint. 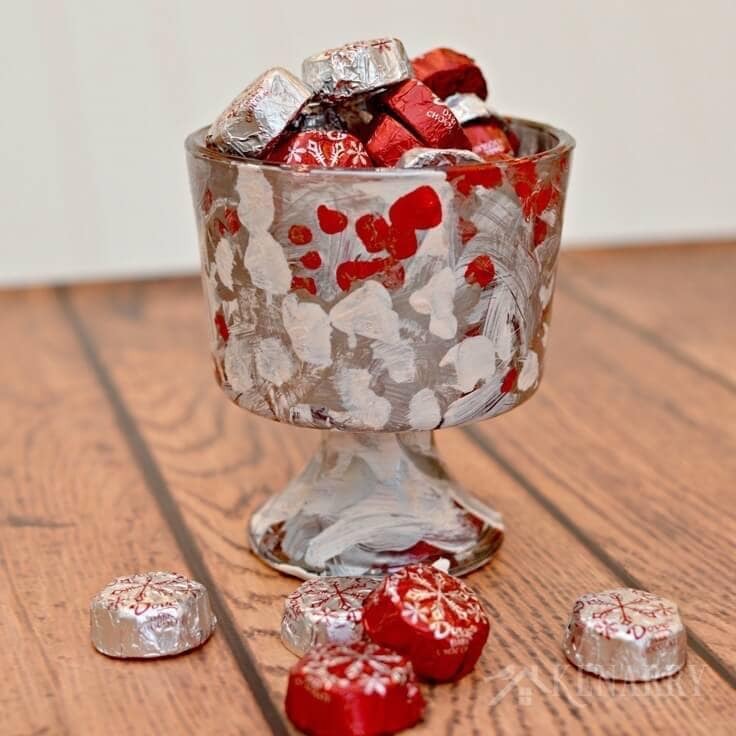 Most importantly though he beamed from ear-to-ear when he walked into his classroom carrying this holiday candy dish wrapped in cellophane and tied with a bow. 1. Prepare the holiday candy dish. Remove any stickers from the glass bowl. Wash and dry it thoroughly so you have a clean surface for painting. I used Goo Gone to remove any sticky residue and then ran the glass bowl through my dish washer. 2. Paint the first layer. Flip the candy dish upside down so you’re looking at the bottom of the bowl. 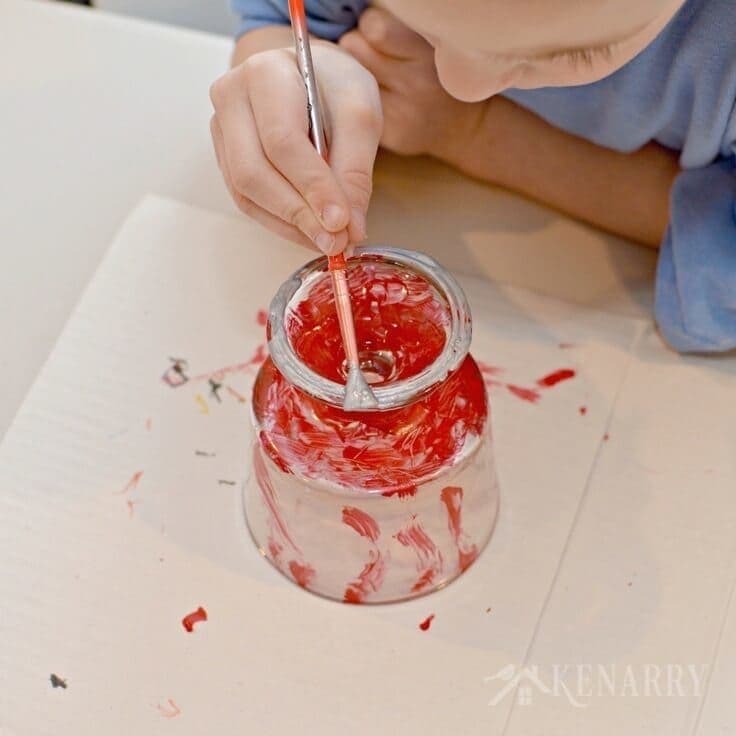 Have your child use a small paint brush to put the first layer of color on the holiday candy dish. 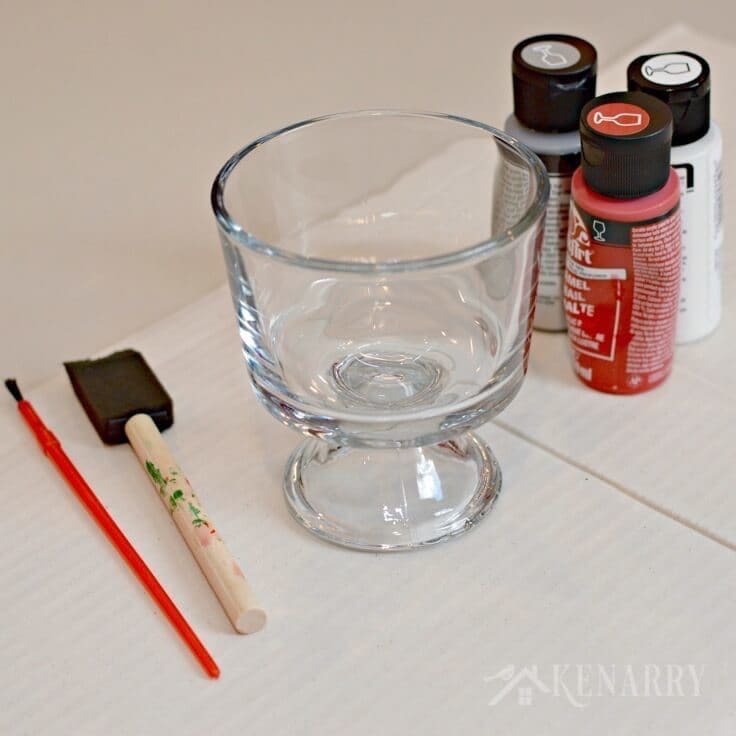 You’ll see in the photo my son used a red enamel paint, but you can use any gloss enamel craft paint color for this project. Let the first layer dry thoroughly. 3. Paint the second layer. 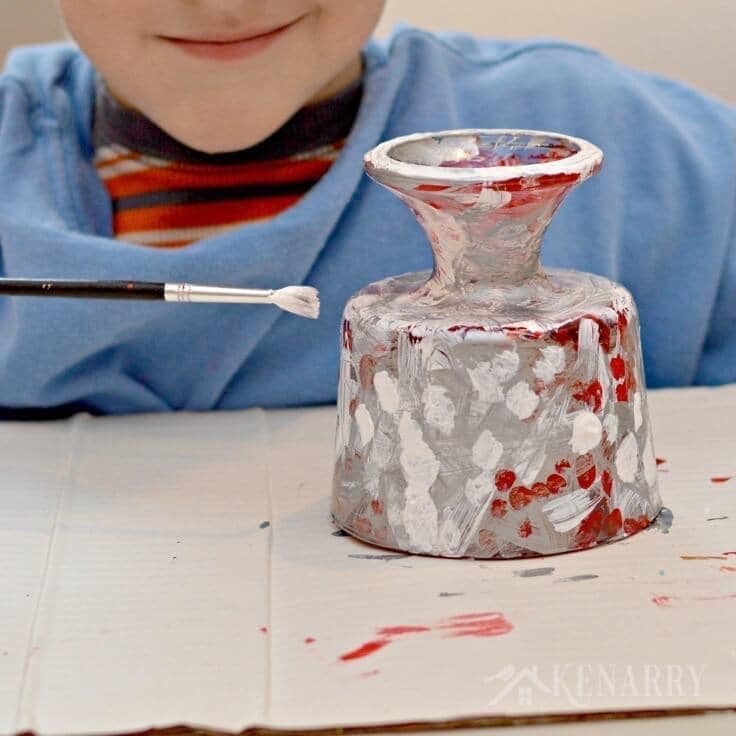 Next have your child paint a second layer of paint using a contrasting color. Tell him or her to fill in “empty” spots but not to cover all of the first layer. You want some of the red to still show through. Again, you’ll want the paint to dry completely before you paint the next layer. 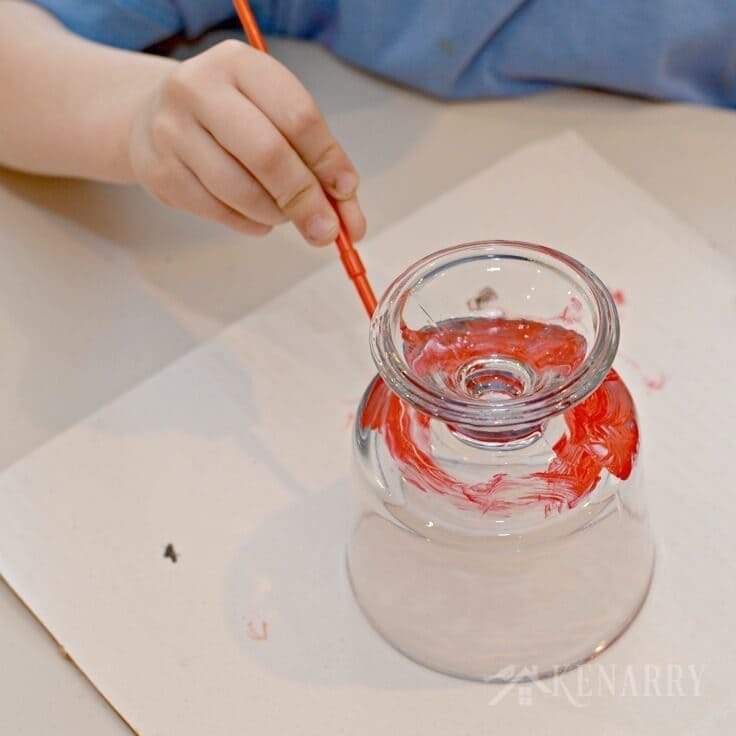 Continue this method of painting a layer and letting it dry over and over again until the entire holiday candy dish is covered with paint. My son and I did this project over the course of a week using red, silver and white enamel paint. He would paint just a little each day and then let it dry overnight. You can use a blow dryer to speed up the drying process if you want. Eventually he repeated some of the colors a few times if he felt like a spot needed more red or silver or whatever he wanted. I let him decide. 5. Allow the Holiday Candy Dish to dry. It may take a while before your little artist has decided there are enough coats of paint on the holiday candy dish. Once the artist is done, be sure to allow enough time for the holiday candy dish to dry completely. 6. 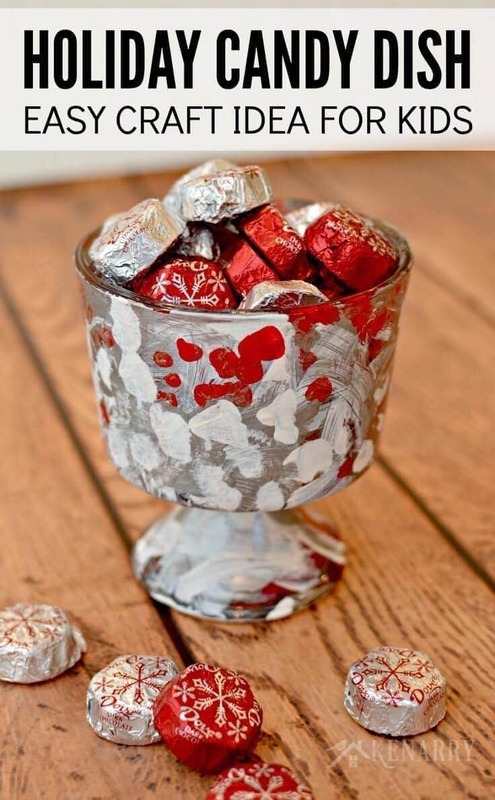 Cure the paint on the Holiday Candy Dish. Method 1: Air Dry. Let the holiday candy dish air dry for 21 days. Method 2: Bake in the Oven. Put the holiday candy dish on a metal baking sheet and place it on a low rack in the oven. Heat the oven to 350 degrees. Bake the holiday candy dish for 30 minutes. Turn the oven off and allow the holiday candy dish to cool naturally with the oven before removing it. IMPORTANT: YOU MUST PUT THE HOLIDAY CANDY DISH IN THE OVEN BEFORE YOU TURN IT ON TO PREVENT THE BOWL FROM BREAKING. Once the paint has cured on the holiday candy dish, it is dishwasher safe and ready to be filled with candy. What a great idea for a Christmas craft. Thanks for sharing with us at Funtastic Friday Blog Hop! Thanks, Debra! So glad you liked it!